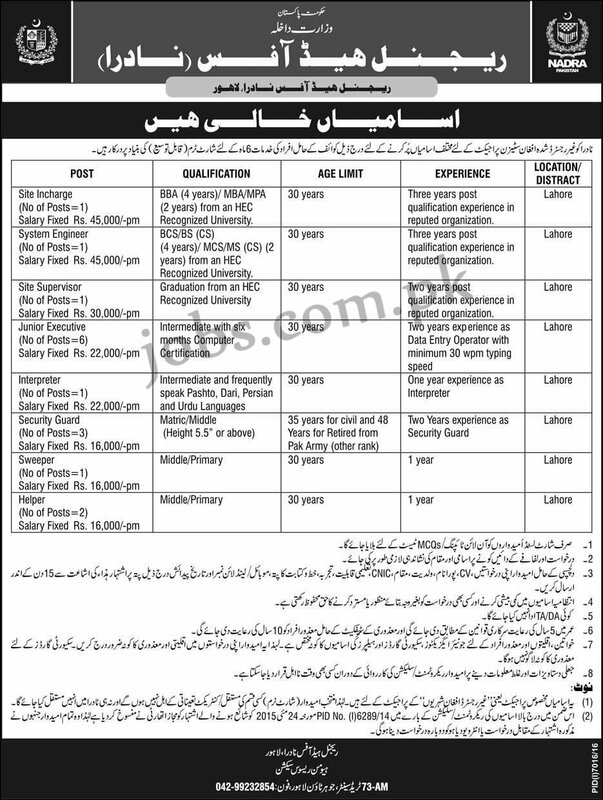 NADRA Jobs 2017: NADRA is inviting applications from eligible candidates for 16+ Vacancies at Lahore Regional Head Office. Required qualification from a recognized institution, relevant work experience and age limit requirement are as following. Eligible candidates are encouraged to apply to the post in prescribed manner. Incomplete, late, hand written submissions/applications will not be entertained. Only shortlisted candidates will be called for written test/interview. See the notification below to see vacancies/positions available, eligibility criteria and other requirements. Eligible candidates must submit applications on or before 7th July 2017. Education: BBA (4 years)/ MBA/BPA (2 years) from an HEC Recognized University. Education: BCS/BS (CS) (4 years)/ MCS/MS (CS) (2 years) from an HEC Recognized University. Education: Intermediate with six months Computer Certification. Education: Intermediate and frequently speak Pashto. Dari, Persian and Urdu Languages.